Pearls have always been considered a gem that denotes elegance and sophistication. They are often the gift choice for graduates or sweet 16 gifts. Many high school graduates wear white pearls in their senior photos. In a way, pearls have become a symbol of maturity. While it may be true that a white pearl necklace is normally a young women’s first piece of pearl jewelry, once they have experienced the smooth finish of a pearl caressing their neck, they want more. Tahitian pearls are their answer. Tahitian pearls are black pearls that are formed by the black lip oyster and, as you would suspect from the pearl’s name, those oysters are found around the South Sea Islands. Tahitian pearls range in color from silver to gray to black. Sometimes they even have a green tint to them that is really pretty. They all have an almost metallic shine to them. The combination of dark color and metallic luster make them a fabulous party dress accessory and an absolute must for every jewelry box. 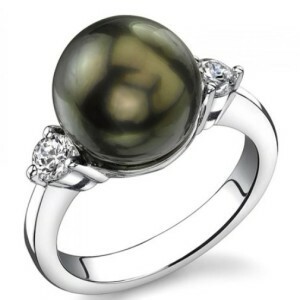 This page showcases the best selection of Tahitian pearl jewelry available online. Here you will find an array of beautiful pieces including pearl earrings, pearl necklaces and pendants, pearl bracelets and pearl rings. Prices range from a less than $200 to well over $2000 depending on the setting. Any jewelry that includes diamonds is going to be more expensive, but they really do add a beautiful contract to a black pearl. Whether you are shopping for yourself or looking for a gift for someone special, there will be a Tahitian pearl here to suit every occasion, every taste and every budget. For those of us who have fallen in love with a string of pearls, I have included this exquisite Tahitian pearl necklace. The string of pearls is 18″, but you choose which size pearl you prefer. There are 3 sizes available starting with the smaller 8-10mm and going up to 10-12mm. Once you have your string of Tahitian pearls, you may find you desire a delicate single pearl pendant or a lovely pearl with a diamond accented setting. These pieces are truly simple elegance at it’s best! Adding diamonds to create a heart shaped setting gives a unique flair and speaks of love. What a wonderful gift to give or receive. Pearls form naturally as a process from a living organism – an oyster or mussel. In year past, rare, natural black pearls could be found in certain areas of Tahiti, specifically where the warm lagoons mix with nutrient-rich sea water. They come from the oyster ‘pinctada maxima’. The grow in the oyster shell as a reaction by the oyster to an irritant such as a grain of sand. In response to the sand, an oyster produces a calcium carbonate coat that builds up around the intruder, resulting in a pearl. They are rare enough to be extremely expensive but are much prized. However, pearls can grow in an oyster with some human intervention and in Tahiti they have been growing them successfully for many years now. Following a process derived by Kokichi Mikimoto in the 20th century, a tiny particle of polished shell is injected into the oyster shell to act as an irritant to produce a pearl. A salt water pearl develops in around 2 years, freshwater pearls are quicker to develop, but can these can produce some very interesting ill-shaped pearls that have a thinner shell than sea-water pearls. Whether you desire the simple elegance of the single pearl posts or the diamond tear-drop pearl earrings, any of these earrings would be a stunning addition to your jewelry wardrobe. Actually, you may find that you would like to own both styles. The posts for more casual daily wear and the drop earrings for special occasions. These Tahitian pearl earrings would certainly make a wonderful gift for any occasion. Earlier, I provided an explanation of how pearls are made. Now, I would like to explain the difference in the jewelry terms. Natural pearls were harvested straight from the Persian Gulf and they are extremely rare today. They are believed to be mostly harvested. Most Tahitian pearls are “cultured” pearls, which simply means they are cultivated in a pearl farm. The mollusks that produce the pearls are raised on the farm. When they are mature, a mother of pearl “bead” is surgically implanted in the mollusks so the pearl will form. Two of the three featured rings are priced under $200! Most often you will find a single Tahitian pearl set in a ring. The settings may vary greatly, but due to the size of a pearl, they are generally single pearls. As with most jewelry, the more diamonds used in a setting, the more expensive the ring. However, using cubic zirconia allows you to have the look without the expense. With elegance, style and quality all in one, the single Tahitian pearl rings would make beautiful gifts that could be treasured for many decades! A bracelet is often the last piece to be purchased when collecting a set of jewelry. However, with the Tahitian Pearl bracelets, you may well decide you want them first. Whether you are starting your Tahitian Pearl collection or finishing a set, either of these bracelets would be lovely. As with the necklaces and earrings, you just might want both styles. One for formal and the other for casual. To clean you Tahitian pearls, you simply wipe them with a soft cloth. Pearls are easy to scratch or damage so you never want to use a jewelry cleaner or solvent on your pearl jewelry.